In 1972 Italy’s appellation system was just about 10-years-old. Wineries were beginning to bottle wines they’d been selling locally in town centers where people would fill jugs from taps and hoses. These local specialties were in the process of becoming better and better and better. This was the beginning of the wines of Italy that we are so fortunate to know today. 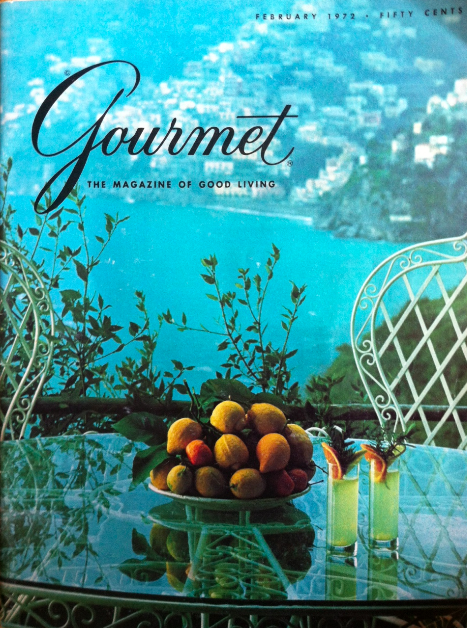 Toward the end of May I was able to spend some time with my grandmother who gave me a new old issue of Gourmet Magazine from ’72 . This is my favorite one yet. Among the amusing ads, dinner party plans, and refreshingly good writing was a piece by Hugh Johnson, The Wines of Italy- Part 1. Reading through, I felt privy to a moment in time long after the land that became Italy began making wine and right around the birth of its quality wine production. The piece begins with a point that, even with modern winemaking, I hope will always be true of most Italian wine, “Noble as their names are, and long as they have been cultivated, most of even the best Italian wines are still cottage industries.” Though there are certainly regions and producers that are making downright good wines, part of the beauty of Italy is its diversity. There are so many little towns and regions that are making individually special wines which fit their community and culture in specific and delicious ways. It is not a question of whether these wines are the greatest in the world- Italian wine is so much more than that. It is a question of if they are a soulful and enlivened expression of a variety and all that cultivates it. It is a Schiava that is a Schiava, a Ciro that is a Ciro, an Est! Est!! Est!!! di Montefiascone that is exactly that. They are interesting and contemplative and telling of a history of terroir, people, politics, patterns, cuisine, and all of the idiosyncrasies that follow along. Johnson uses part one to bring his reader through the North, from west to east, making note of grapes, wines and, in some cases, producers on his path. For example, he provides a rundown of Piemonte’s “reliable suppliers”: Fontana-Fredda, Franco Fiorina, Pio Cesare, Contratto, Bersano, Damilano, Marchese di Barolo, Borgogno. And by hearsay: Giulio Mascarello and Francesco Rinaldi. He says that everything about Barolo and Barbaresco is “massive”, which is an entirely apt descriptor, though I believe that the massiveness of then and the massiveness of now has probably transformed quite a bit. Not only are Barbera and Dolcetto mentioned as Piemonte’s other red varieties, but also Freisa and Grignolino, which we rarely hear about. Such a shame because Grignolino is such a delightful light red; I would drink it any/every day of the week. Johnson also mentions Spana and it’s homeland around Gattinara and Ghemme, “Though in tiny supply, is really often as good as good Barolo.” Not to be forgotten! Running up the road into Valtellina, Johnson talks about Sassella, Grumello, and Inferno, saying they are deep and dark and need to spend a long while in cask before even being considered ready for drinking. They were not widely available then, and though they are not super available now, there are certainly more accessible and approachable versions of Valtellina’s chiavennasca on the market these days. Oh how far we’ve come. Johnson arrives in the Veneto and puts forth that Soave is “possibly Italy’s best white wine” and that the “narrow green Soave bottle announces a thoroughly civilized experience”. He acknowledges Valpolicella rosso’s usefulness as an everyday drinkable wine, even if a bit bitter on the finish, but cannot get down with Recioto, the “dark brown pride and joy” of the region. In Modena, Johnson writes, “Lambrusco, the local specialty, will always remain rather a joke with me.” I find it impossible to take fizzy red wine seriously. THANKFULLY, after years and years of phonies, the dry, slightly tannic, palate-cleansing REAL lambrusco has made its arrival on the US market. Its goodness cannot be denied. There is more and more, I wish I could read it all to you; shall I? It is in the introduction that Johnson hits the nail on the head. That is the nail that, stubbornly, will never fully be hammered into place- the elusive enticement of Italian wine. A beauty far better experienced and personally understood than explained. PS- Just a little song. It’s a nice one for humming.